All links in this page, except those with the prompt (this link is integral to the text), are best ignored at first. The search for the true nature of life and the laws that regulate it appears to be an integral part of life itself. Most religions and their influence on us bear witness to the strength of this search. As a rule, major religions, with the exception of Buddhism, depend on faith. In addition to this faith-based search, a complementary collective endeavour aimed at an empirical analysis of the material aspect of life has also been slowly gathering momentum since the dawn of civilization about five thousand years ago. It has produced an impressive body of knowledge that we broadly call science. The impact that applied science, or technology, has had on us and the world in which we live is all too plain to see. With the discovery of DNA by Francis Crick and James Watson around 1950 science has also begun to knock on the door of life itself, and even just the effort to open it appears to have produced remarkable technological results in biology and medicine. Yet there are indications originating from physics that science is still in its adolescence and as such is unable to grasp the true nature and the laws of matter, let alone those of life. Bob Wald's remark 'if you really believe in quantum mechanics, then you cannot take it seriously' illustrates this position of physics. Judging by the enormity of what may follow both technologically and otherwise, access to life scientifically may not be possible until the foundation of science has become mature and true to itself, at least enough to be able to see the real material world. The twentieth century had shown signs of a struggle for this maturity and integrity when it began to appear that the members of any pair of fundamental opposites are complementary. Apparently this revelation moved Niels Bohr so deeply thar he chose Contraria sunt complementa (Opposites are Complementary) as the motto for his coat of arms. The following quote, which is also the first of just two principles that guide this website, indicates the depth of Bohr's perception of opposites. This Bohr's vision of opposites is not entirely new; Charles Darwin and Alfred Russel Wallace with their Theory of Evolution had already established a biological basis for it, by the nineteenth century. For, this biological evolution is a syzygy, or an archetypal pairing, of the two opposing processes of Natural Selection and Random Mutation. Recent advances in evolutionary biology show that the original framework of this superlative theory is inadequate. For instance, Natural Selection has now expanded to include Genetic Drift, and gene transfer is now lateral as well as vertical. These inadequacies reflect the immense complexity of the process of evolution. Even the role played by the Fundamental Particles of Matter may not be as passive as it at first seems, and Mind may make its own contribution in a manner not hitherto even suspected by contemporary science. This website aims to examine these possibilities rationally and scientifically. A prerequisite of this program is the recognition that a living being spans three principal pairs of opposites. They resmeble the 'Three Worlds and three Mysteries' of Roger Penrose which he called Platonic, Mental and Physical, in his book, 'The Large, the small and the Human Mind'. Perhaps the most fitting rational description of the three pairs of opposites that a living being spans is as follows. is correct, and the Anthropic Principle is sound, then basically all that needs unravelling is the structure of matter. For, according to these two views, the concept of a fundamental particle of matter is already in conformity with the concept of a living being by spanning its own equivalents of the above three pairs of opposites which are as follows. Perhaps the immense depth of the structure of these physical equivalents is what compels some of us to think that the physical world alone is all that exists. However, even that immensity is able to represent only the Body and Mind, just two of the above six components that make up a living being. If the physical world, indeed, does serve as a model for the biological world, then that model is a rational and objective basis in relation to which we can come to terms with the otherwise overly mysterious and metaphysical deeper vistas of life. It is unlikely that this basis, directly or at once, should enable us to reach higher levels of technological perfection, but without it we would find it virtually impossible to solve the mystery of life, or more precisely the mystery of an individual human being. The present state of physics provides us with no solution to this mystery owing to its inability to join the two halves, (Symmetry - Field - Linear) and (Antisymmetry - Particle -Matter). Present consensus has it that the second half is the more fundamental of the two, and as a result, physics has buried itself in a quagmire of chaos with no sign of an impending renaissance in sight. Simply put, established physics can only point to Chaos - Consciousness - Mind, which projects only a chaotic view of life. Ask physicists for the ultimate law(s) of the physical universe and they would say there is none, accordingly you and I are the results of just random occurrences worth only a few pennies of cheap chemicals. This website presents the view that life is not chaotic but balanced in respect of the three pairs of opposites of life, and that exactly the same balance operates in the physical world in respect of its own three pairs of opposites. No sensible person would dispute that balance appeals to intuition and that it applies to all situations in life. That being the case how is it that 'Symmetry' ( this link is integral to the text ), and not this all-pervading Balance, is presently at the centre stage of physics? Following are four answers to this question. We often think of symmetry as a precise statement of balance. However, that balance is static whereas true balance is also dynamic. It has an extraordinary pivot that resembles the one in the old-fashioned merchant's balance; in both cases the pivot-body, or the fulcrum, which has no limits placed on its shape and size makes no contact with those that it balances. Thus, there is a singular aspect to balance that could all too easily escape notice. The concept of a pivot in the physical world is actually not new. For, it is implicitly present in the law of the equality of action and reaction that was Newton's own contribution to the general framework of physics. This law belongs to the category of things in life that are well-nigh folklore, but also the least thought of in depth. Implicit in it is the idea that fundamentally, things, bodies in this case, never occur singly, but as pairs that interact not chaotically but with the precision of nullity. So, pivotal to the birth of physics in Newton's fertile mind was a null pivotal mechanism that transcends time, as its action is instantaneous. Apparently, the pursuit of excellence in physics is also the pursuit of the true nature of this null pivot in the physical world, as evinced by the change over from Newton's physics to Einstein's relativity. For this change over the null pivotal mechanism changed from two equal and opposite forces, to two equal and opposite rays of light that appear to transcend not only time but space as well. For, each of these rays has a null spacetime speed, which means that the space and time intervals that it describes always coincide and the spacetime interval that it travels is always zero. The exact opposite is true for matter, which moves so that the space-like and time-like intervals that it describes always remain distinct and non-zero. Also, whilst in light the two intervals are the components of a single vector, in matter they are present as two orthogonal vectors. These vectors are the Linear and Rotary components of the motion of matter. 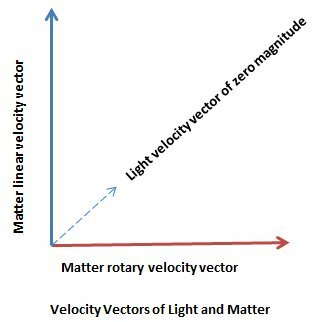 Following figure is an illustration of these light and matter velocity vectors. This website establishes that the interaction between the linear and rotary velocity vectors of matter is not ad hoc but balanced. The Theory section of this website establshes analytically that this balance is such that the sum and difference of the linear and rotary velocity vectors of matter are the velocity vectors of two light rays that travel in opposite directions in space. Thus the pivot for the balance between linear and rotary velocity vectors of matter is the velocity vector of light. Since this pivot is associated with zero spacetime intervals, it makes only a point contact with the physical world while the pivot-body, or the fulcrum, lies outside this world. Thus the syzygy of the linear and rotatry velocity vectors is beyond the reach of experiment, observation or even logic and mathematics. In other words, it lies on the plane of Field - Particle, where a particle of matter is resolved into its basic elements bosons and fermions in the form of point particles. which is above the plane of Body - Mind. This is the reason that sometimes a clever intuitive idea pertaining to the world of mind and matter is referred to as a light above our head, or a light outside mind and matter. Einstein may have had precisely this light shining above his head when he discovered the true nature of spacetime in relation to his unique 1905 paper titled 'On the Electrodynamics of Moving Bodies'. Symmetry is the basic form of physical order. Therefore focusing on symmetry happens almost autonomously and for good reasons. However, the danger here is that of engineered symmetries emerging in place of the natural ones, as Symmetry is only capable of comparison and not of distinction. Balance, however, both compares and distinguishes simultaneously. Symmetry has continued to be attractive to the human mind, from the remote past to the present. Ancient astronomers based their model of the solar system on divine perfection, which they thought was symbolised by circular symmetry. However, the true planetary motion is asymmetric (use this link to see an animation of planetary motion), so discovered Johannes Kepler, the first cosmic explorer who broke away from the bonds of an unnatural all-embracing circular symmetry and found the key to the natural simplicity of cosmic systems in the aesthetically unattractive elliptic motion of planets around the Sun. The ellipse in this case is asymmetric as one of its two foci accommodates the sun while the other remains empty. Kepler reduced the Copernican solar system consisting of thirty-four deferents and epicycles that even then found it difficult to match observations, to a system of just seven ellipses that matched observations perfectly. This website aims to emulate, or even surpass, Kepler; its aim is not to stop at symmetry but to use symmetry to catapult us to the ineffable realism of physical balance and remove the contemporary deferents and epicycles that ravage the beauty, simplicity and inspirational capacity of the foundation of physics. There is no principle higher than balance and that being the case it is also the most elusive to pin down, like the air we breathe which is the most essential to biological life and also the least tangible. It appears that in the face of such adversity, the human mind with its power of abstraction and sense of formal beauty has taken charge and established symmetry as truth. However, the human mind, in spite of its supremacy and power over most things, is still just a component of life. Therefore, what is appealing to it, even in the guise of a fundamental necessity for itself, may need careful introspection if it were to serve at least as part of a sound basis for a physical world possessing a clear measure of objectivity. In fact there are good all round reasons which suggest that the symmetry-appeal in itself is a balancing act being performed at the deepest inner recesses of what may be called the ‘human psyche’ for want of a better phrase. Ever in motion and in change, the restless mind yearns to embrace that which is immovable and invariant in the relentless struggle of the psyche to reach a state of balance. So it seems that the rules of balance by which even mind has to function are accessible only from a stratum of intuition which lies above both mind and matter and controls the behaviour of them both. According to this view, even those high ideals such as morality and liberty that we hold very dear to us see balance as their mentor; this balance is what would be developed and explored at this website. For this the cue comes from how balance operates in the physical world, and to establish this operation use is made of every morsel of firmly established knowledge in physics. In due course, it would become apparent that physical balance is able to bridge the outer reaches of the cosmos and the inner recesses of the atom and complete this program that Newton initiated with what was available to him in his time. In simpler, colourful words, it would become clear that balance drives both galactic systems and heat engines; it tenders equally to both rust and rose petals. Balance is certainly not stasis; clearly, it is also different from total and perpetual change. However, stasis and change find common ground in balance. Such complexity of balance is what instils the feeling of chaos in some, and indeed, the opposite feeling of creation in others. The feature that contributes mostly to these extreme views is the singular nature of the fulcrum involved in the process of balance. The fundamental features of true balance, including this singular nature of the fulcrum, are outlined here ( this link is integral to the text ) using an ordinary merchant's balance and a simple pendulum as models of pure static and pure dynamic balance, respectively. The fulcrum in both these cases is a truly singular feature in that it can be as large as the Earth itself at base, but must reduce virtually to zero at top and turn into a pivot. In that sense fulcrum is, as the saying goes, both Alpha and Omega as far as those that it balances are concerned. However, as the second case of pure dynamic balance shows, fulcrum can depend on those that it balances, and it turns out that the ultimate form of this dependence is quite deep, but perfectly comprehensible. As discussed earlier, there is such a fulcrum for the ultimate physical-balance, and there is also a fulcrum for the ultimate life-balance and it accounts for the apparently singular aspect of life that often throws regular life into confusion. The cause of much of the controversy about life, be it science against religion, theism vs. atheism, to mention just two, is the failure to comprehend and come to terms with this balanced state of life. Because of life's singularity, there is always more to life than even the most profound of our systems of beliefs, thoughts or even empirical discoveries. Even so, they are also the stepping stones which allow us to reach out to the singular reference of life in an effort to realise life's ultimate state of balance, which basically amounts to 'doing the right thing according to the prevailing circumstances no matter how painful, pleasurable, altruistic or self oriented that action may turn out to be'. This deceptively simple dictum can also be devilishly difficult to practice, especially when it matters the most. In such circumstances, access to a clear vision of the blue print of life is what we require. Most would agree that in our age of knowledge and reason, acquisition of this vision could, and should, begin with physics. Accordingly at this website a sui generis theory of the physical world develops which subsumes relativity theory in somewhat the same way that the latter subsumes Newton's theory. It clearly shows that quantum mechanics despite its remarkable strength and accuracy is still mainly a tool which has been developed to cope with the present incomplete knowledge of the basic architecture of the physical world and the failure as yet to capture its latent beauty and 'simplicity'. A fitting name for this theory is Balance as its basis is the elusive balance that we discussed, above. This website also aims to dispel an asphyxiating myth that has gripped physics by its throat. This myth is that 'reality' is so different and distant from ordinary living that it can only be the territory of privileged classes such as academics, and conglomerates operating super expensive experimental and observational rigs. On the contrary, 'reality' ignores educational, social or economic distinctions. It makes no distinction between the basic architecture of a particle of matter and that of a living being. In our past rational awakening, Newton saw this very clearly, for he said in his 'Opticks' that 'Nature is very consonant and conformable to herself'. In today's rational world so also did Richard Feynman, as he refused to accept that he understood anything unless he was able to explain it convincingly to the non-professional. It often requires a great deal of patience to sit and think for as long as it takes to notice this remarkable conformity in life. Just to take a simple but basic example, both a particle of matter and a living being would optimise the path that they would traverse to go from a location A to a location B. On an even more fundamental note, the physical world is a 'love affair', or an isotypic pair formation, between proton and electron just as it is also with the animal world of male and female. Proton purveys the element of stability that is essential for the perpetual dance of the electron just as it is also in the animal world where the male is often the stabilising element, and the female, the element of activity, colour and chemistry. There are many more tantalising parallels. Every fundamental feature of the sub-atomic world or of the vast reaches of the cosmos has its reflection in our ordinary lives and vice versa, and to trace these parallels is an exhilarating adventure that no rational thinking human being should miss. Adventure can lead to discovery, and so it is in this case. Existence of fundamental parallels such as the ones mentioned above signals that the deepest fundamental features of the theoretical basis of the physical world might have life-parallels that would make it easy to see the right or the balanced path that we should follow in life. For example, the rational theoretical basis of physics is strictly local, and is free of global speculations. Instead of speculating on global features, allowing them to develop naturally in terms of those that are strictly local has been the proven procedure. Euclid's fifth postulate is a good example of a global speculation that may even have held back geometry for quite a while. Therefore, it seems that the rational basis on which we formulate our path in life should be strictly local. A stance which opens up global questions such as 'whence come I and whither go I' is to be abandoned in favour of one that queries, 'Now that I am here what should I do'. The next conscious and balanced step that we take is what matters, and if there is such a thing as a universal consciousness it would then respond autonomously. There is so much to achieve in the here and now to construct a balanced frame of mind and no time to waste, so the spirit of science whispers in our ears. Often it is the scientist, on account of being forced to focus on the exception rather than the norm in an effort to bring clarity to the latter, who misses out on this adventure and therefore it is they who sometimes have to, in the end, struggle harder to regain their balance. Perhaps owing to the brutal nature of this struggle, contemporary physics does not portray a world that bears much resemblance to the real world of intuition. For example what physics, even if it is computationally accurate in a certain specific area, has any luminous reality if it implies that the moon does not exist if it is not looked at and that a single object can be at two different places at the same time? Even that computational accuracy has come at a great price, the price of contriving to cancel out point-particle infinites by creating more infinities, or the price of carelessly sweeping infinities under the carpet, as it were, in the case of string and superstring theories. For in these theories the string can only ultimately come into being as the result of a point moving with infinite speed, if it is, indeed, assumed that there can be no other premise which is more basic to physics than the displacement of an event in spacetime. Just as fundamental particles of matter have eventually formed into a cosmos, so have fundamental ideas of physics now evolved into an extreme state of a cosmos of its own which is as far removed from the everyday human thought as is the cosmos of stars and galaxies from ordinary matter. Yet it produces remarkable results, or facets of truth, without which it would be impossible to formulate the basic layout of the physical world: rather like, it would be impossible to 'formulate' life without the higher elements that are being cooked in the raging infernos at the cosmic end of the physical world. The present distant state of physics is mainly due to symbolic abstraction that is characteristic of the world of mathematics. It is as if literature has had to step aside to give way to complex and incoherent fabrications. Here in this website literature has the final word.